Nipping lawn Weeds in the Bud! Fall is upon us and soon the rainy season will be, too. This means more than just remembering to take your umbrella, though. Weeds love a lot of things that your lawn could do without – thin spots, too dry soil, underfed grass, and more pertinent, soil that’s too wet. While some rain is good for the grass, too much water just puts the welcome mat out for a weed invasion. Not to worry! Grangetto’s has the following list of helpful tips to nip the weed problem in the bud. Just like us humans, lawns need a proper diet. Nutrient-rich, regular feedings result in strong, healthy root and grass. Unlike slow-cooker meals, this isn’t “set it and forget it” either. This is a year-round commitment to keeping your grass well-fed. After the first mowing in spring, give your lawn a banquet with Dr. Earth® Super Natural Lawn Fertilizer. Make sure there’s a summer smorgasbord, and a fall & Thanksgiving feast, too. Your lawn will thank you. It’s a basic fact that lawns need to be watered. However, too much of a good thing is too much, and too little isn’t enough. It’s important to find the right balance. Your lawn needs a deep watering once or twice a week, that’s all. Those every day shallow watering sessions actually stress your lawn and make it more susceptible to weeds. In fact, weeds thrive on the shallow watering that stresses your lawn. 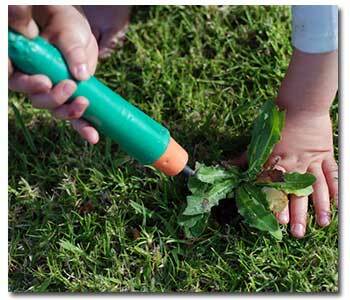 You might already have a war of the weeds on your hands. But all is not lost! You can address this problem while preventing new weed growth. A feed and weed product such as Bonide® Crabgrass and Weed Preventer contains a pre-emergent – something to keep grassy weeds from growing. It also provides great post-emergent weed control, so this is two-in-one winner! For a fall application, follow the product instructions: Apply a few days after mowing and hold off on your next mowing for a few days. The product works best when activated by a ½ inch of rainfall or irrigation. Your local Grangetto’s carries this, and many other lawn-beneficial products. Stop in and see them soon!